Tag Archives for " Icarus Deception "
Few people have captured the post industrial world of work like Seth Godin. Now, you may think of him as a marketer – and he is a brilliant one indeed. I believe, however, his greatest contribution to business is the very clear message about how work has evolved from one of factories and rules to one of making ideas and art. To be sure there are still many who play in the world of producing things by way of orderly process but, increasingly, people are trying things on the side of design and causing a good ruckus while they play. As the cost of making things, trying things, starting companies and practicing your art has come down, so too has the cost of failure. Trying your idea out and failing is not such a big deal any more, playing it safe and normal is. 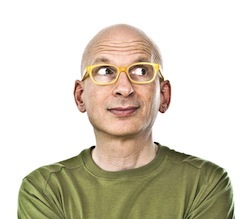 I spoke with Seth Godin for this week’s episode of the Duct Tape Marketing Podcast and he shared his thoughts on some of the myths and deceptions that hold people back. Godin recently set the publishing world abuzz, once again, by using a crowdfunding service to prove that people were interested in the notion of his next book before he ever sought a publisher to produce it. With a guaranteed large print run in hand he was able to dictate, to a large extent, the type of deal he wanted. In his now published work, The Icarus Deception: How High Will You Fly, Godin reveals the often mistold told story or Icarus. As most people will recall, Icarus famously flew too close to the sun against his fathers advice. This act of hubris led to his demise. The lesson of course, is don’t try to soar too high, right? The part of the story that is rarely told is that his father also told him not to fly too low as the salt and mist of the sea was equally fatal. Godin’s contention is that the current environments of work, school and even organized religion are often to blame for people aiming too low. The Icarus Deception is above all things a cry for a revolution of sorts. A cry to get more people to start sharing their ideas, designing their lives and telling people about their art. One of the best ways to embrace this idea may be to attend one of the more than 1,000 Icarus Sessions happening on Jan 2. You can find or organize an Icarus Session here and read all about how the sessions work here.